I dropped by the Mojave Air and Space Port earlier this afternoon. WhiteKnightTwo and SpaceShipTwo were sitting outside of the Scaled hangar. Nobody seemed to be around. The preparations for Monday’s flight will likely start late tonight or early tomorrow morning. Best of Luck to pilots David Mackay WK2 @virgingalactic & Mark Stucky SS2 Scaled Composites on 1st powered flight tomorrow. Safe Landing! Previous test flights have begun after sunrise, which is set for 6:03 a.m. PDT on Monday. They might take off earlier tomorrow; it’s difficult to say. 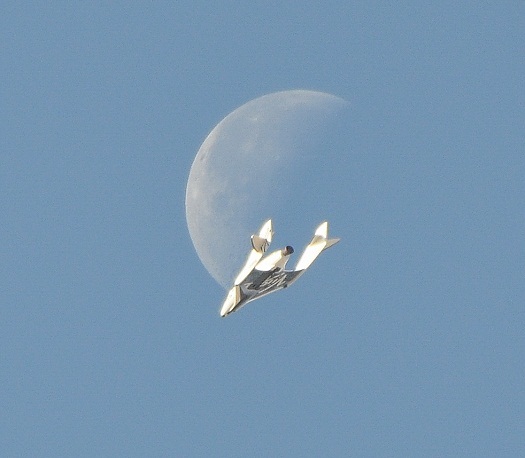 It usually takes about an hour and 15 minutes before WhiteKnightTwo to get to 50,000 feet and release SpaceShipTwo. That might take longer because they are firing the engine for the first time. I will be Tweeting @spacecom. I’ll also post update on the Parabolic Arc page on Facebook.